1 Capsicum - chopped into 1 inch long pieces. 1 Potato-chopped into 1 inch long pieces. Mix all the ingredients for the marinade, and toss the chopped veggies in it. Make sure all the veggies are well coated. Set aside for around half and hour. In the baking tray, arrange a foil, and preheat the OTG at 200 degrees C for around 10 minutes in the toast mode. Now place the marinated veggies one by one in the tray, and bake for around 8 to 10 minutes at 175 degrees C.
Let the veggies cool for some time. Remove gently using tongs. 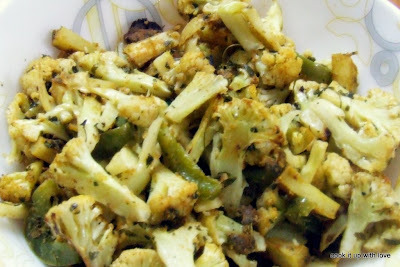 Serve with rotis or rice. Tastes good as a snack too. (for all those health conscious people out there). This entry was posted in Lunch box ideas, OTG Recipes . Bookmark the permalink.